Everyone loves a good bit of sparring between tech companies, and here’s a great example. LG is literally photobombing Samsung ahead of its bigger rival’s Galaxy S4 launch in New York today. Last week, Samsung made a series of very prominent mentions of a new billboard it is using in Time Square to tease the launch. It even hinted that there will be some kind of event for members of the public happening in conjunction with its media launch. Well. It just so happens that LG has owned ad space on the ironic Square for 20 years. It just so happens that its billboard is positioned directly above Samsung’s. 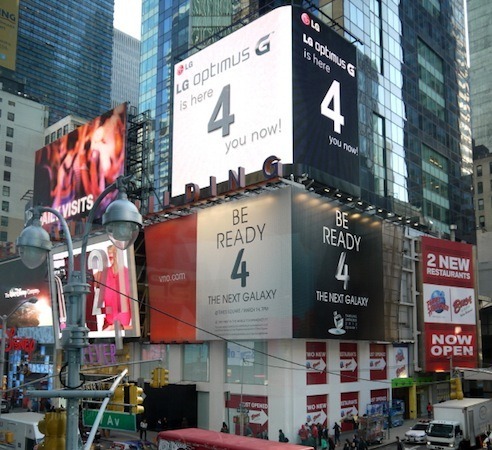 It just so happens that LG has changed its board to ape Samsung’s ‘Be Ready 4 The Next Galaxy’ with a slogan of its own: ‘LG Optimus G Is Here 4 You Now’. Undoubtedly it is cheeky, very clever and perhaps a sign of concern or need for attention — oh, and don’t forget ironic since LG’s new Optimus G Pro is yet to make it stateside? Either way, the photo — via Engadget — below is highly amusing. LG’s board even sneaked a spot in Samsung’s latest pre-event teaser video. Samsung has done more than this billboard of course, using a combination of street dancers, flash mobiles, among other advertising efforts.